Keep your workers and on-site visitors safe by preventing any and all electrical hazards from becoming dangerous problems. Construction sites are already full of hazards, so why add to them? While electrical hazards are not the only pressing concerns on a construction site, there is still plenty that can go wrong. Keep your workers and on-site visitors safe by preventing any and all electrical hazards from becoming dangerous problems. Here are some safety measures that you can enact. Part of preventing any potential electrical hazards is to monitor the possible causes and sources of anything that might present a problem. How is your site’s electrical energy supply controlled and directed? The energy you use may come from generators, but at some point, power will be switched from primary sources to backup sources, either because of some accident or storm knocking the power out. But once construction is underway, generators are not as necessary, and the backup sources are only meant to be short-term solutions. Both sources, primary and backup, need to be monitored – especially if they need to be repaired. Don’t forget about the presence of live wires and old utility lines; the old utility lines you can find with the assistance of ground-penetrating radar, or GPR. Start out by creating a policy, and more importantly, putting it in writing. Determining the best safety measures is a collaborative effort; not only do the contractors in charge of performing lockout procedures need to work together, but they also need to consult with the director of safety before any construction work can begin. Also, don’t overlook another crucial element of the process: maintaining proper documentation once the construction project is underway. Where are the energy controls on your construction site? These consist of valves, switches, breakers, and plugs. They should also have permanent labels and tags indicating their location and purpose. Disconnect them according to OSHA guidelines. 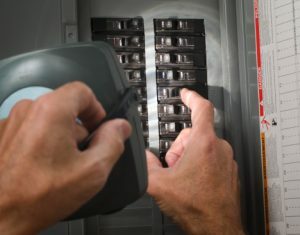 You must also train your employees and workers in proper electrical safety practices. Keep your training as current and updated as possible. Books, posters, software, and training films on DVD are all critical elements of a good training program. Lastly, giving your employees and workers the right equipment, tools, and protective gear will help keep them safe and allow them to address any electrical hazards they come across without fear of harm or injury. Keep heavy-duty padlocks on hand to protect heavy machinery when it is not in use and ensure you have the proper signage indicating the possible hazards in that area. G&M Services has a great amount of expertise, experience, and training when it comes to demolishing concrete, so trust us with the job. We understand how dangerous our important work with concrete can be, and we take safety precautions every minute of every day to prevent anything bad from happening. We offer many different services to our valued clients, including concrete drilling, concrete scanning, and FireStop. For more information on our services, contact us online or give us a call at (410) 787-8828. For more safety tips and interesting articles, follow us on Facebook, Twitter, Flickr, and LinkedIn. This entry was posted on Friday, October 6th, 2017	at 2:18 pm	. Both comments and pings are currently closed.